DD5LP/P – May 18th and 23rd 2016 – DL/AM-180 Berndorfer Buchet. A week before the first activation, Andrew VK1MBE contacted me to ask if we could set up a Summit-to-Summit contact at some point as he needed a second DL association S2S contact for his Mountain Hunter-S2S award. Of course, I was happy to oblige. I had actually given Andrew his first DL S2S contact from Peissenberg about a year ago. A both weather and radio conditions have been poor of late, I wanted to get out and try for a new Long Path contact into Australia – after all my call sign is DD5 L P HI. I checked and saw to my surprise, that I hadn’t activated Berndorfer Buchet yet this year (it is the closest summit to my home location) and I had made contacts into VK from there previously, so we agreed a date in the hope that there would be a break in the continuous rain we’d been having and all was set. I packed my bags the day before the trip. In fact it was more an un-pack of what I no longer needed. I was taking my home made amplifier along, however I had made some modifications since last time I had it out. One modification was to install an internal LIPO battery in the case. I did this for two reasons, firstly to avoid having the weight of carrying the external battery bag which has two 5000 mAH 3 cell LIPO batteries (one as a spare) and an inverter to take the 11v from the batteries up to the 16v that I now run the amplifier on and secondly to avoid the RF noise from that inverter, which runs quietly at 13.4v output but not at 16 volts. I had also added an extra relay so that the cooling fan (brushless fan, that also creates HF “hash”) only comes on when we are in transmit mode. 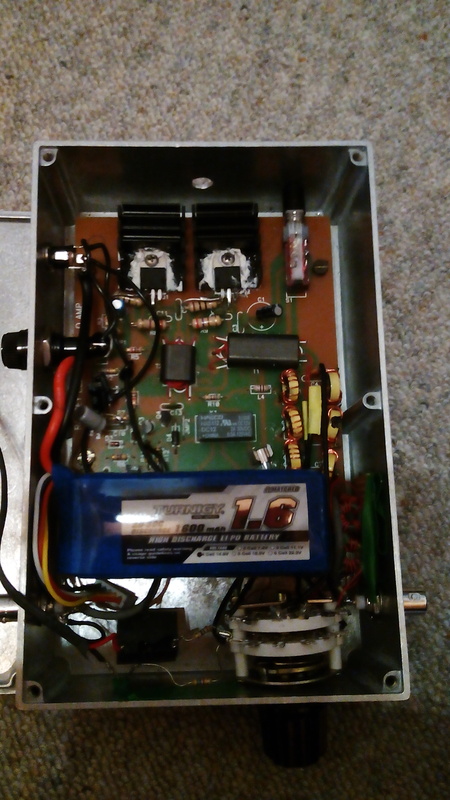 The homebrew amplifier with the lid off the case – note the small 1600 maH 4S LIPO battery running across the case in the lower part of the picture. I also chose to take the SOTAbeams linked dipole as I only intended to operate on 20 metres, so there would be no need to lower and raise the antenna to change bands and the SOTABeams antenna is lighter than the Spiderbeam OCF dipole that I normally take as it has no need for a Balun. With the WIA AGM being held on Norfolk Island, a few SOTA activators are present who plan to activate the (relatively easy to get to) VK9/NO-001 Mount Bates SOTA Summit. Indeed both Paul VK5PAS/VK9PAS and Peter VK3PF/9 planned an activation around the time that long path to Europe could be open on the 23rd. of May. Given the successful activation on the 18th. (read details below), and with the hope that the forecast heavy rain would hold off, I put out my SOTA gear ready, planning the same equipment and location as had worked on the Previous Wednesday. Berndorfer Buchet is the hill overlooking the village of Paehl which is at the bottom of the Ammersee (one of five lakes near Munich). It is at worst 45 minutes drive from my home QTH near the town of Landsberg am Lech. A fairly early rise to get to the summit for 0630 UTC when we expected radio conditions to be at their best. The weather looked good as well and indeed it turned in to a sunny day, if still cold while I was on the summit. As normal I arrived earlier than planned for the activation but then was delayed by something as silly as the support cord on the end of the dipole tangling itself up while I was trying to find the best place to tie the inveted-v antenna off to. Once I had the equipment running I put out a call for Andrew on our agreed frequency of 14.310MHz and got no reply – but I was still 30 minutes early at 06:00 UTC. The planned contact time was 06:30 UTC. So I put out a CQ and spotted myself – no answers. I started to wonder if I was getting out or whether there might be a bad connection somewhere. Tuning around I found Paul RZ6BR in Labinsk, Russia. He was calling for DX but after a couple of calls with no response, I called him, apologised that I was not DX but could he please give me a report. No problems he gave me a 5-9 report with deep QSB. We had a short chat and then I left him to his calling and I went back to 14.310 and put out another CQ SOTA. I then heard a quite faint but understandable VK4RF – Rick in Queensland, Australia. Unfortunately when I passed it back, he didn’t come back to me. Well at least I knew now I was really getting out. In fact Rick tried a couple more times over the next 30 minutes, until we finally made the contact – thanks for persevering Rick! On my next CQ SOTA call I heard “summit to summit” and it was indeed Andrew VK1MBE/P on Mount Ainsley VK1/AC-040 and we exchanged 4-2 reports both ways. The contact was possible because we both had low or no, noise level at each end I think. That being said 15 minutes later (at 06:30 UTC) Andrew was up to 5-4 or 5-5 strength, so the original planned time would probably have been the ideal time for the contact, but we made it – which made for a succesful activation. I also had calls from two other Russian, one Bulgarian and one Greek chaser all at 5-9+ strength. My last contact was with Pedro EA2CKX at nothing like his normal strength, so I think the skip distance was long, blocking out most of western europe for me. I woke up even earlier for this activation than for the previous one, expecting that Norfolk Island may become accessible earlier than the ACT being somewhat further East. I had a good run down to Berndorfer Buchet taking just 35 minutes to drive there. One more trudge up the hill, all the time hoping that the rain would hold off. The skies were threatening but often that can be the case and no rain comes. I was set up and operational by 05:30 UTC (7:30am local). Although the VK9 stations had been spotted I could not hear anything – it was a little early for long path, only expecting something possibly from 06:00 UTC onwards. So in the meantime I put out a call made a contact or two and then went back to monitoring 14.310MHz where the VK9 stations were operating on. From time to time I could hear “something” in the noise but not at a workable strength. I heard a few VK chasers working Peter VK3PF/9 but I could not hear Peter. Mike 2E0YYY was also out in the UK on this “VK9-hunt” so I had a quick conversation with him and then I went back to listening for Norfolk Island (NI). I even put out a couple of “blind calls” with the hope that the NI guys might be listening and hear me. Unfortunately the radio conditions were not there on the 23rd. and apart from Mike working Ernie VK3DET who was about 3-3 with me and Mike, there were no long path contact to VK this day.The inter-Europe contacts suffered from very deep QSB at times, so it seems the band was really unsettled. On my drive home, the rain started and continued for over 24 hours solid, si at least in that factor I had been lucky. After this rain, Berndorfer Buchet will be difficult to access. So if I get another chance of an NI S2S contact on another day, it will have to be from a different summit. The first activation was a success. The equipment worked as it should and I managed the contact into VK with about 20 watts. Would it have been possible with just 5 watts? I think so, but it would have been a harder job for Andrew! The second activation, while not managing the desired contact into Norfolk Island, proved the kit again, having had its batteries charged after the first activation, I could simply grab the bags and go and everything worked. I am getting very close to being able to take ONLY the camera bag on these activations.